Punjab Food Authority Monitoring and risk analysis of different food items produced or marketed is one of the important functions of the Punjab Food Authority. Food surveillance is carried out through sampling, raids and daily inspection visits to different premises which are involved in production, storage and marketing of food items. So now they announced the Jobs for various Positions. To Fill the vacancies for these Jobs 2019 They invited the application forms from the eligible candidates. If you are competent eligible and Interested to get this job then you must apply for NTS Test. 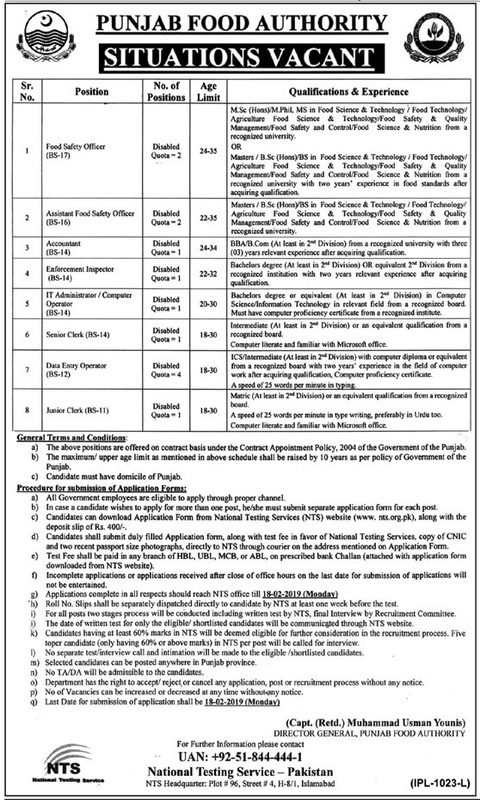 Because Punjab Food Authority has assigned the NTS to conduct the test for jobs hiring. Once you will apply on nts testing service for these jobs then next process is the Preparation for the test. and We are providing you the Online MCQs Test Preparation For the NTS Test that are provided below. The above positions are offered on contract basics under the Contract appointment policy 2004 of the Government of the Punjab. The maximum upper age limit as mentioned in above schedule shall be raised by 10 years for disabled person to be appointed against quota for disabled. In case a candidate wishes to apply for more than one post, h&she must submit separate application form for each post. Candidates can download Application from National Testing Services (NTS) website (www.nts.org.pk), with the deposit slip of Rs. 400/-. Candidates shall submit duly filled Application form, along with test fee in favor of NTS copy of CNIC and two recent passport size photographs. directly to NTS through courier on the address mentioned on Application Form. Test Fee shall be paid in any branch of HBL, MEEZAN, MCB, or ABL, on prescribed bank Challan (attached with application form downloaded from www.nts.org.pk websites). Incomplete applications or applications received after close of office hours on the last date for submission of applications will not be entertained. Applications complete in all respects should reach National Testing Service office till 18-02-2019 Monday. Roll No Slips shall be separately dispatched directly to candidate by National Testing Service at least one week before the test. For all technical posts two stage processes will be conducted including written test by National Testing Service final Interview by Recruitment Committee. The date of written test for only the eligible shortlisted candidates will be communicated through National Testing Service www.nts.org website. Candidates having at least 60% marks in NTS will be deemed eligible for further consideration in the recruitment process. Five topper candidates in NTS marks per post will be called for interview. No separate test interview call and intimation will be made to the eligible shortlisted candidates. No TA DA will be admissible to the candidates. Department has the right to accept, reject or cancel any application, post or recruitment process. No of Vacancies can be increased or decreased at any time without any notice. Last Date for submission of application shall be 18-02-2019 Monday.